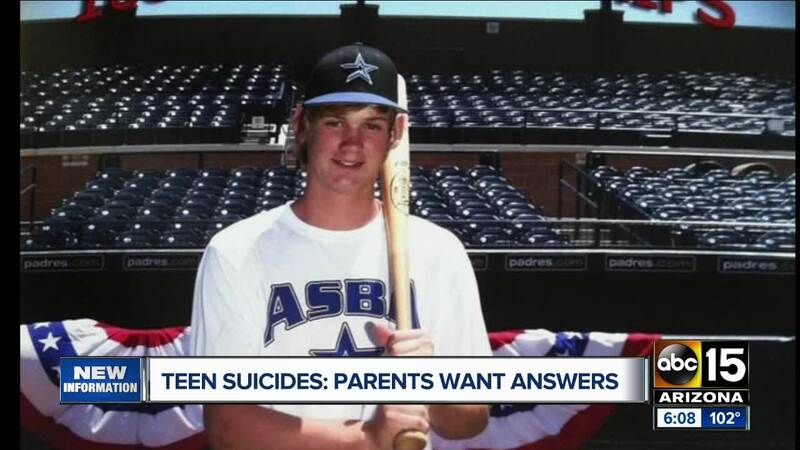 Many parents say they want schools to do more about teen suicide prevention. Schools across the state are talking about a very tough subject this week: teen suicide. It's something many districts are now tackling head-on after losing so many of their own children over the past few years. 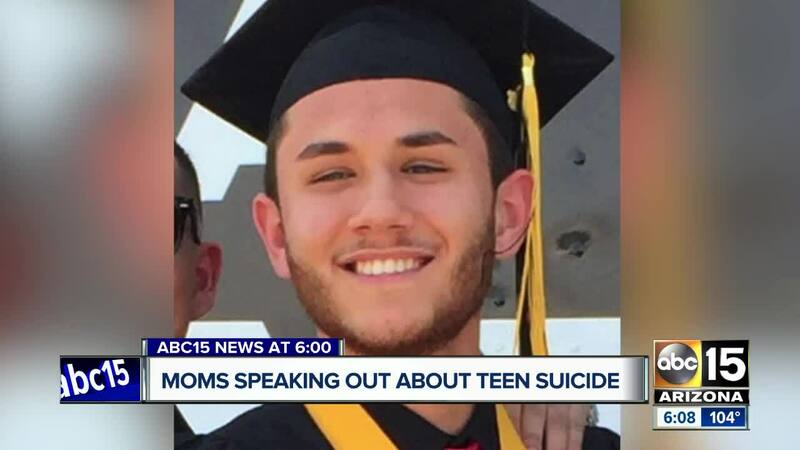 Last summer 17 students in the Valley killed themselves, and just in the last two weeks ABC15 Arizona has learned of at least four additional teen suicides at schools in Chandler, Mesa, and the West Valley. It is a tragedy that has affected so many communities and shattered so many families. Sheila Hedstrom-Pelger lost her 17-year-old son Tyler to suicide last year. She tells us Tyler was about to start his Senior year, he loved marching band and music. "He was popular, he was happy all the time, he was positive," said Hedstrom-Pelger. She said she shared a close relationship with her son, but if she could look back at the red flags, she would encourage parents to try to form deeper connections with their children. "He was very critical of himself, hypercritical. I did have a great relationship with Tyler. I felt like we were close but I honestly think we should have been deeper. There is something that was missing to where he could have come to me on a deeper level," said Hedstrom-Pelger. Samantha Whirley is another mom who lost her son, Jacon Alvarado, to suicide. "It was not expected. Not expected at all. Nobody really expected it because he was so popular," said Whirley. She described her son as the class clown who made everyone laugh. She called him "compassionate" and said he was nicknamed "Dr. Phil" by his friends because he liked to counsel others. He even talked a classmate out of committing suicide once. Whirley said her son suffered from anxiety but she had no idea of the anguish he may have been feeling. After his death, she got ahold of one of his class papers. It was his last school assignment, in which he had been asked to write about himself. Whirley found some signs of anguish within that paper. "I have many issues that make everyday life difficult for me. The most significant of these issues being anxiety. Most people don't know what it's like and say just get over it," Whirley read. "Overall I just want to find my place in this world. Though this has proven to be a difficult time, I have not yet given up." Whirley said her son died shortly after writing that paper. She encourages everyone to show their children love. Natalya Chimbo-Alvarado with the nonprofit organization Community Bridges Arizona said teen suicide is a crisis in our community. "Every seven hours we lose someone to suicide," said Chimbo-Alvarado. The organization worked with school districts to raise awareness about the issue. She added that she was glad to see many schools taking bold action to counter the problem. At least 53 districts in Arizona are now printing the suicide hotline number on student IDs and some districts are hiring full-time staff and putting crisis counselors inside schools, but she added that there were some districts that needed to step it up. "It has been a taboo subject, or we have people say 'this doesn't happen in my community or my school.' You can't go against the data. It's very frustrating, especially those school districts where they're continuing to lose youth and they're not being as receptive and open to available free resources," said Chimbo-Alvarado. She encouraged families and school districts to talk about teen suicide. "Let's have that awkward and scary conversation, but that conversation could potentially save a life," said Chimbo-Alvarado. To find out more about teen suicide and resources available in your community, check out the following links.